Coca Steamboat, originally uploaded by Camemberu. January has come and gone. The year 2008 is almost ten per cent over! Soon too will the Year of the Pig go, as the Chinese Lunar New Year (CNY) approaches. I love the Year of the Pig. Somehow the Year of the Rat does not sound as bountiful or appetising but hey, the auspicious "2008" should make up for it. 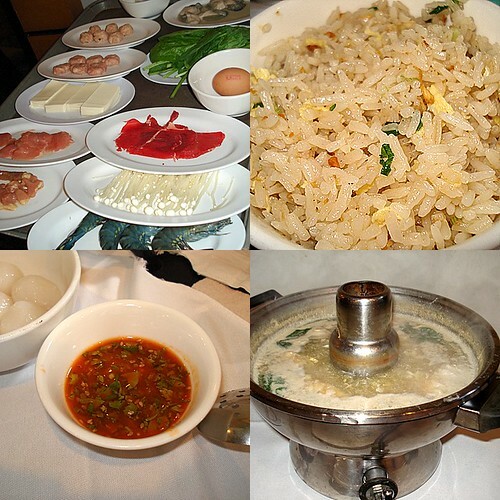 Many families will choose to celebrate CNY eve with a steamboat dinner. I normally head home to Malaysia to see my folks but this year, my trip will be delayed as six-week old Jolie is still too young to travel that far. So what will I do for CNY here? Steamboat too? Well, if so, I just know it won't be at Coca Steamboat! In all my years here, I have never been tempted to eat there, but I somehow wound up at its International Plaza branch early last December (when my other choices were all full up or not open yet at that hour). 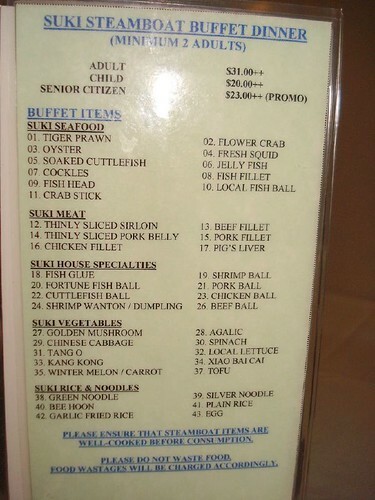 Menu for suki steamboat dinner, with outdated pricing, originally uploaded by Camemberu. To be fair, the ingredients were fairly fresh (except for the oysters) and the prawns were a good size. But variety sad, portions measly and the soup stock was a bit weak. Their famed chili sauce, well, was all right but I think I prefer the dipping sauces at Chongqing and Paradise on Earth. I did like their garlic fried rice though. Service? Initially prompt and attentive - because we were the only ones in the place at that time. But a bit clumsy - the waiter dripped hot water (condensed steam) all over my arm when he removed the steamboat pot metal cover. His voice must have been really soft as I did not hear an apology. Didn't see much of him either after that. On the whole, a very expensive dinner at S$33++ not including charges for pickles and towels, which push the final figure closer to S$40. And note that they DO NOT serve water (whether iced or warm). The steamboat leaves you very thirsty, so going without a drink can be uncomfortable. Still, my friend and I steadfastly refused to give in to their mean policy and went to the Isetan basement afterwards to quench our thirst. My first and last time at Coca. I agree that Coca's prices are high. Was there once at the taka branch, and don't think I would return anytime soon. Its the location I suppose; food quality and variety wise, its run of the mill. Hi Camemberu, sounds like a bad dinner experience. Guess when it comes to steamboat, I'll stick to your earlier recommendation Paradise on Earth. I never tried Coca before. I am a "steamboat" lover. I went there yesterdat at about 8pm. Waited for a few minutes and the manager came. I asked for a table for 2 and he said "We are full, come back after 8.30pm to try your luck." Not so friendly of him. By the way, check out the price, at $35++ per person is not cheap for steamboat with regular items. For that lesser than that, wmy wife and I can get live prawns at another place. Will not even try Coca. I know of people who swear by Coca but I'm not a fan. I guess they are not short of customers somehow (despite their pricing), judging from the "full house" you described.